Sometimes We Choose Life, Sometimes Life Chooses Us. I still remember the call that in all likelihood, changed the trajectory of my life. There I stood, in the queue for the gondola ride to the Giant Buddha statue in Hong Kong, earphones plugged in, listening to Death Cab for Cutie, exploring a city all by myself for the first time. I didn’t expect to hear back from them so soon. The female voice on the other end was polite but frank. “I’m afraid you didn’t get the role”, she said as my heart sank. My book, The Shooting Star, released last week! Order a copy here. The year was 2009 and I was in Hong Kong, loaded with the enthusiasm of a 20-year-old determined to crack a job interview with a hot shot bank. Even though I never felt inclined towards finance and banking, I wanted the job so bad – it paid enviably well, promised year-long postings in exotic locations around the world and with the financial recession underway, was one of the few companies still hiring new graduates. In my business suit, I had breezed and sometimes stumbled through the rigorous 3-day interview process. Now, as I was excitedly exploring Hong Kong, I didn’t expect to receive a rejection so quickly. I didn’t expect to have my dream shattered so quickly. But life is a funny thing. When we think we’re failing, we are simply forging a different, often more rewarding path for ourselves. And so it was with Hong Kong. I left the city in despair, subconsciously never intending to return. Besides, all I remembered were cabbies who never understood where I wanted to go, fake snow on the sidewalks ahead of Christmas and trouble finding affordable vegetarian food. But as it turned out, the city wasn’t done with me. 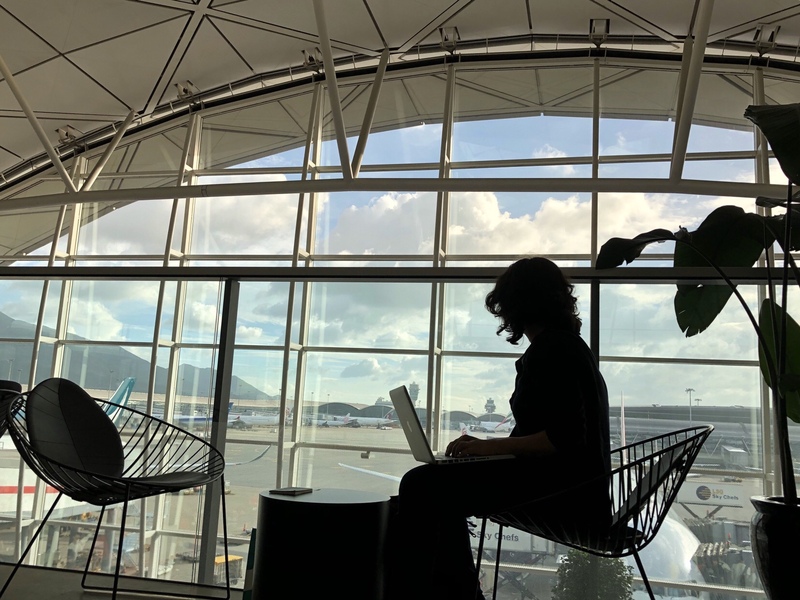 On my way to India from California earlier this year, I tucked in comfortably for the long journey on the spacious Premium Economy seats on Cathay Pacific (a collaboration with the airlines), intending only to transit quickly through Hong Kong airport. But several hours, movies and gin & tonics later, I happened to miss my flight connection in Hong Kong. Much to my surprise, I was not only put on the next available flight the following afternoon, but seamlessly checked in to an airport hotel – with almost 24 hours to explore a city that I had never really given a chance to impress me. Stunning take off over San Franciso. Warming up after a rainy day with peppermint tea at The Pier. As I took the airport express to Hong Kong Island, the scenery changed from industrial estates to the soothing blue South China Sea to lush green mist-laden hills. I spent a rainy day wandering about the by-lanes of the old city, stopping to catch a traditional ceremony at the old Man Mo Buddhist temple, riding the long Mid-Levels Escalator that connects one end of the old town to the other, browsing bustling street markets in the backdrop of high tech skyscrapers. Impressed by the city’s growing vegan movement, I relished a cacao smoothie bowl at the eco-friendly Mana Cafe, feasted on Hunan dumplings and dragon maki rolls at the innovative zero waste Grassroots Pantry (a worthwhile splurge and you get 15% off with a Cathay Pacific boarding pass) and sampled tandoori mushroom quesadillas at Confusion Plant-based Kitchen. Drawn into the city’s eco-friendly movement, I splurged on shampoo and conditioner bars (as opposed to single-use plastic bottles) at Lush and vegan chocolates at Natures Village. Cacao smoothie bowl at the vegan and eco-friendly Mana cafe in Hong Kong. On that unexpected stopover in Hong Kong, I couldn’t help asking myself what if that call, all those years ago, had turned out differently. What if I had scored the job I was so keenly eyeing, accepted a career in banking and never failed at life so I could end up forging a different path? As I warmed up with peppermint-infused green tea at the charming teahouse at The Pier (a stunning lounge at Hong Kong airport) and lay on my full-flat business class seat on the Cathay Pacific flight onward to India, I couldn’t help but wonder if I had actually chosen this life of long term travel for myself. Maybe, this life had chosen me. The life that chose me? Have you ever felt like life has chosen a different path for you? And is Hong Kong on your travel wish list? *Note: I was hosted on my flight from California to India via Hong Kong by Cathay Pacific. As you know, opinions on this blog are always mine. Join my digital nomad journey on Instagram, Twitter and Facebook! Get my recently released book, The Shooting Star, on Amazon / Flipkart. Shivya, I explored Hong Kong as a solo traveler and the first thing I did was I decided not to chase list. I chose just a few places and enjoyed the relaxed pace. Although I wouldn’t rate it as a great tourist destination but I certainly recommend everyone to experience this great city for its spirit. I also faced quite some problem in finding good vegetarian food. I find both HK and Sigapore as one of the best cities when it comes to public transport connectivity. Good call! I enjoyed it much more the second time round – with no list to check off too. The app Happy Cow is a life saver when it comes to finding vegan / vegetarian food. Awesome! Can you let us know where the last picture in the post (in front of the lake) was taken? Thanks! That’s in the Lake District, UK! That was amazing. And what a life that has chosen you… Feel so happy to read such things. This a inspiring journey ! Thanks Sharad; those failures morph into successes only in retrospect – isn’t that the beauty of life? HK looks brilliant from your photos. The food there is yum yum, I heard from a friend who has travelled there. Awesome, hope you love it too! I think we choose always! Even though it doesn’t always go how we like it but the choice is always ours! It’s not easy, but one that you can get pretty used to and grow people around into too. Keep making room for those things you love – they’re what matter in the long run! Awesome. Enjoyed it so much. Designs of life are difficult to understand! Enjoyed the post. Thanks Bikram; they can be complicated sometimes. You inspire people in so many ways. Such an inspiring journey. ThamT you for sharing this with us. Life can seem so random, but when you look back at it, your story reads like a finely crafted novel. Great inspiration! So true! Steve Jobs said is best, about the dots connecting only in retrospect. Thank you for sharing this, Keep it up Shivya ji . Of course I’ve been doing that for years. You’ll find plenty of hidden gems from India on this blog! Fake snow on the sidewalks ahead of Christmas and trouble finding affordable vegetarian food.I appreciate your time and effort in your work. Keep posting..
Haha, I’ve come a long way in my relationship with HK since! Such a inspirational story and journey. I never taste dumplings but after seeing this pic of yours I want to. good work and keep up the work. Previous PostWild, Adventurous and Quirky Things To Do in Jodhpur. Next PostSri Lanka Tourist Visa (ETA) for Indians: Requirements and Tips.